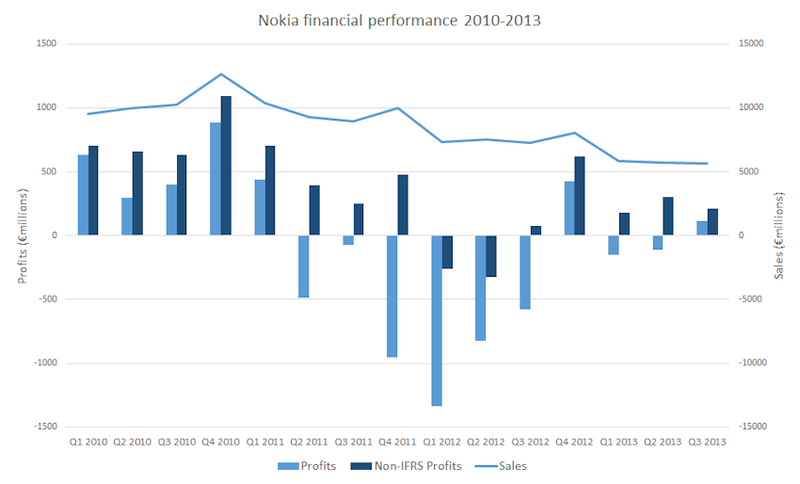 Nokia's non-IFRS figures (a measure of underlying performance) show a higher profit (€215 million) than the standard figures, due to one off charges around restructuring (-€57 million), costs associated with the Microsoft deal (-€18 million), asset amortization (-€17 million), and other factors (total of €97 million). The key Devices & Services division made an underlying loss of €86 million, down slightly from Q2 2013, but, along with the operating margin (-3%), are a significant improvement on the Q3 2012 results. The headline results were slightly ahead of expectations, which together with improved mobile phone sales volumes (up 5% quarter on quarter) and a positive outlook for the NSN business, has resulted in a small rise in the Nokia share price (up 5%). The 19% growth in Lumia device shipment shipments, ahead of the proposed acquisition, by Microsoft, of Nokia's Devices & Services business, was also a positive sign. Today's results are clearly being released in the shadow of the Microsoft-Nokia deal. While Nokia's Devices & Services division position is substantially improved from a year ago, device volumes, especially in the smartphone segment, are not yet sufficient to drive sustainable profits. Nokia's Devices & Services volumes continue to look modest next to Apple or Samsung. 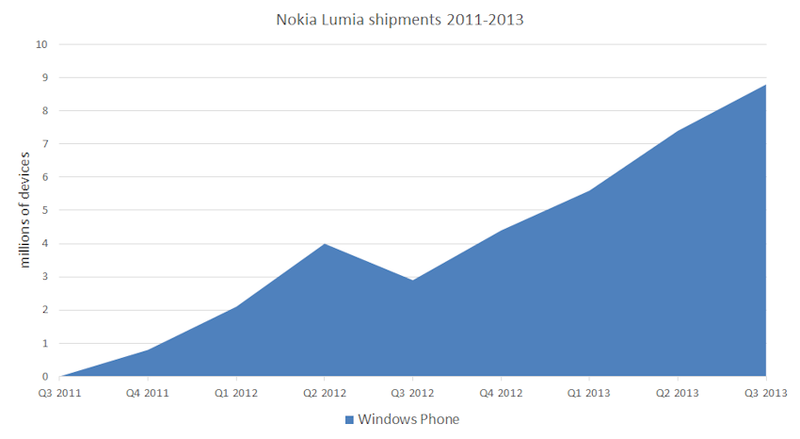 However, the continued growth of Lumia devices volumes is a positive trend. Moreover, assuming a similar cost base, smartphone volumes of around 13-16 million would result in profitability for the smartphone business, a level which now seems reachable in 2014 (the exact number depends on ASP and cost base). In the press release and associated comments, more attention than usual is being paid to the HERE and NSN divisions. The two divisions, together with the new Advanced Technologies division (patents and R&D), will make up the Nokia Group, assuming the Microsoft-Nokia transaction is completed. Both the NSN and HERE divisions generated solid profitability (€166 million and €14 million respectively) and positive margins (6.4% and 6.6%), with the latter improving both quarter on quarter and year in year for both divisions. Sales figures for both divisions were down quarter-on-quarter, but this is primarily the result of seasonality. NSN and HERE combined profits and sales are €180 million on sales of €2.764 billion respectively, reflecting a healthy business. The NSN division is the major potion of this, but HERE's figures are impressive for a relative young business that is still in the investment phase. In many ways, the Q3 2013 results showcase a tale of two Nokias, with a dichotomy between the devices business and the networks/location businesses. "Subject to the planned completion of the Microsoft transaction, Nokia will have three established businesses: NSN, HERE and Advanced Technologies. Our strategy work is making good progress and it has already become clear that there are meaningful opportunities for all of our business areas: NSN, HERE and Advanced Technologies. In all of these businesses, we have strong assets that we continue to invest in for the long term benefit of our customers and shareholders." "The third quarter was among the most transformative in our company's history. We became the full owner of NSN and we agreed on the sale of our handset operations to Microsoft, transactions which we believe will radically reshape the future of Nokia for the better. Subject to the completion of the Microsoft transaction, Nokia will have significantly improved earnings profile, strong financial position and a solid foundation from which to invest. We are pleased that NSN and HERE both generated solid profitability in what was a seasonally weak third quarter and at a time when we continue to make significant R&D investments into future growth opportunities." Nokia reported Lumia sales of 8.8 million in Q3 2013, up from 7.4 million in the previous quarter. 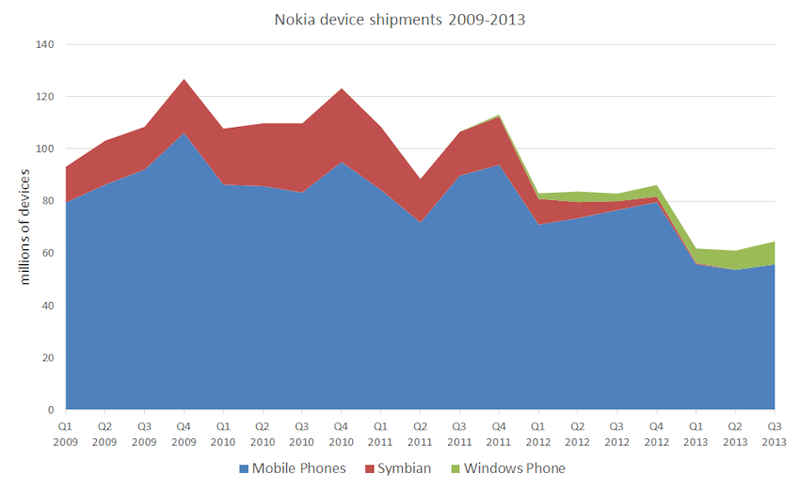 Nokia reported that Symbian device volumes for the quarter were "approximately zero", down from 3.5 million units a year ago. Total Windows Phone sales (all manufacturers) for Q3 2013 are likely to break 10 million for the first time. This is almost three times the number of BlackBerry devices sold in the same time period, but less than a third of the number of iPhones sold in the third quarter. 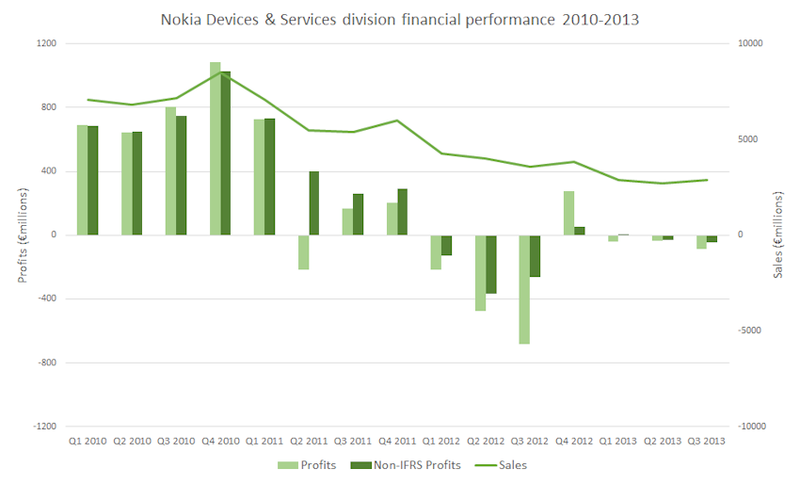 Nokia's mobile phone volumes were 55.8 million, up from 53.7 million in Q2, but down from 76.6 million in Q3 2012. Asha Full Touch devices were 5.9 million of these devices. Nokia and Microsoft will be encouraged by the trajectory for Lumia device volumes, which grew at a similar rate to the preceding three quarters. This pattern should continue into the high sales period of the fourth quarter, which means Nokia will ship more than 10 million Windows Phone devices between October 1st and December 31st 2103. The average selling price (ASP) for Nokia's Smart Devices was €143 (down 8% from €155 in Q2 2012 and down 9% from €157 in Q2 2013), reflecting an increased proportion of lower cost devices (principally, the Nokia Lumia 520). The ASP for Mobile Phones was €27, down from €31 in Q3 2012, but up from from €26 in Q2 2013. Together with the improved device volume figures, this suggests Nokia has been able to improve the performance of its mobile phone business in the second half of the year. This is underlined by the fact that Mobile Phones continues to provide a positive contribution margin (3.6%), significantly better that the contribution margin of the smart devices business (-17.1%). In terms of the geographic breakdown of sales, shipment volumes and sales declined, compared to a year ago, in all regions except North America, reflecting the decrease in mobile phone sales year-on-year. In North America, device volumes increased by 367%, as sales of the Lumia 520/521 increased, but overall volumes (1.4 million) remain relatively modest. Quarter on quarter increases in device volumes were also recorded in Europe (up 17% to 13.2 million) and Asia-Pacific (up 17% to 20.2 million). 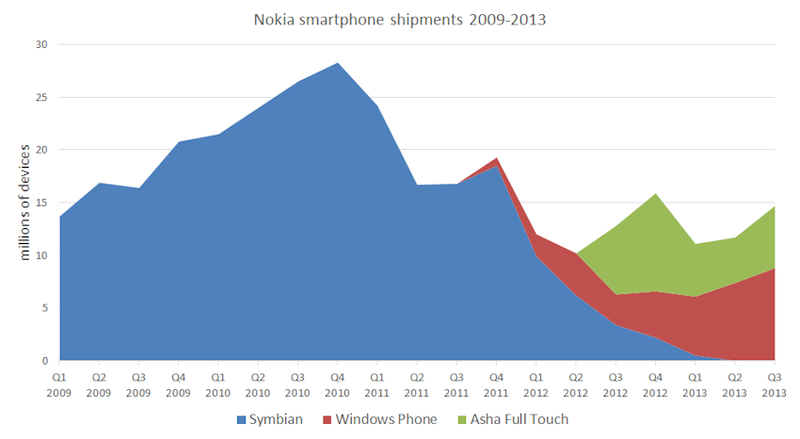 Combining Windows Phone and Asha Full Touch device sales gives a total smartphone volume of 14.7 million units. This compares with 11.7 million in Q2 2013 and 10.2 million units in Q1 2012 . The improving sales of Asha Full Touch devices has been driven by the release of the Nokia 501.